An event for all ages and abilities where athletes will enjoy the precise organization and execution of a Platinum Racing event, all with a laid back atmosphere! Our awesome volunteers make the day fun by ensuring you stay on course and cheer you on! This is an inexpensive chip timed event giving runners the opportunity to participate without breaking the bank. To keep it affordable for all participants you will receive a timing chip, snacks and water at the finish line but no formal food or event swag will be provided. Drink ticket for Bo’s Bar and Grill & Halloween Half Beer Koozie for all finishers!! Coffee and cookies served by the Mustard Seed for $1 each. Proceeds go to providing lunches to nearly 400 children at 32 different Red Deer Schools. Please respect surrounding businesses and all parking signs. All city lots and street parking are free on weekends. Race Day Registration will be available from 8:00am-9:30am for $40-$50. It saves to register early!! Make sure to give yourself enough time to grab your bib and prepare for a 10am start! Top 3 Male/Female in each event win a free entry to the next race! Shirts can be purchased on race day – $20! Short sleeved Gildan Performance t-shirt. 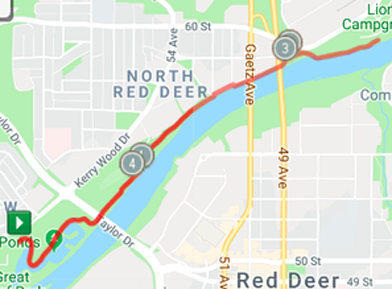 Due to construction, runners will begin at Bower Ponds and run along the river out 2.5km and return along the same trail back to the finish. 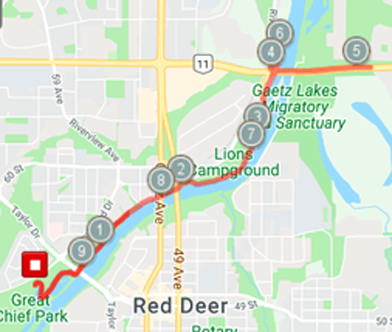 Due to construction, runners will begin at Bower Ponds and run out 5km, along the river to the top of 67th Street and then return on the same trail back to the finish. One big hill! But the good news is you get to run down it as well. Beginning at Bower Ponds you will run along the river to 67th Street where you will cross over and head east up the hill. Near the top you will follow the path into McKenzie Trails, down a nice hill in the trees before leaving McKenzie area. 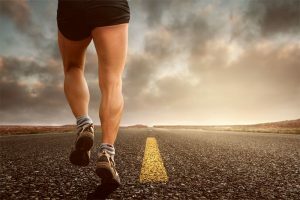 You will run through the parking lot of Gaetz Lake Bird Sanctuary towards Lindsay Thurber where you will do a quick 1km out and back (don’t worry you do not go all the way up Michener Hill) before reconnecting with the river trail. 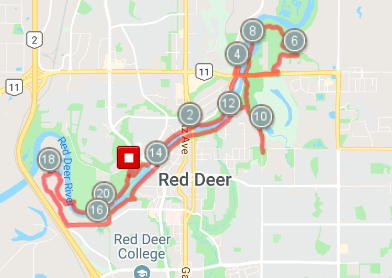 Once back along the river you will run to Heritage Ranch and back to Bower Ponds.